The growing split between progressives and party leaders on deficit spending could define the party's future. WASHINGTON — All across the country, Democratic candidates are sending a message: We're the party that isn't afraid to think big. Elect us, they say, and we'll pursue transformative policies like Medicare for All, free college, and guaranteed jobs. At the same time, Democratic congressional leaders are sending a parallel message: We're the party of responsible budgets. Elect us if you're mad about President Donald Trump racking up trillion-dollar deficits with his gigantic tax cut. The Democrats' two messages are increasingly coming into conflict — and some in the party are starting to notice. "The instinct that some Democrats have, which is born out of a sense of responsibility as the 'governing' party, is to explain exactly how you're going to pay for everything and how it all adds up," Sen. Brian Schatz, D-Hawaii, told NBC News. "It puts you at a total disadvantage because you're already constraining your priorities." While the party is united in its disdain for the Republican tax cuts, some on the left are concerned that Democrats are undermining their agenda by branding themselves as fiscal hawks. Ascendant progressives, with backing from many of the party's biggest names, are demanding tens of trillions of dollars in new spending. Finding ways to pay for it all won't be easy and an increasingly vocal minority say Democrats shouldn't bother. After all, it worked for Trump, didn't it? The left's wish list is headlined by a single-payer health care plan in Congress that two nonpartisan studies, one by the liberal-leaning Urban Institute and one by the libertarian-leaning Mercatus Center, each estimate would cost the federal government $32 trillion over 10 years. Supporters argue the plan could reduce overall health care spending by trimming overhead and negotiating lower prices, but it still requires a massive new source of tax revenue. New proposals on issues like education, jobs, and taxes, all backed by prominent Democrats likely to run for president, add up to trillions more in new spending or tax credits. And if single-payer stalls, more modest tweaks like expanding Obamacare subsidies would still add to the pile. Reversing the Republican tax cuts can only pay for so much and Senate Democratic leaders already plan to use $1 trillion for their infrastructure plan. So some are proposing another approach: Just don't say how you'll pay for things. When Schatz put out a plan for debt-free public college earlier this year, which he estimated would cost $950 billion over 10 years, he pointedly declined to name how he'd finance it. If he had his way, more Democrats would do the same, at least until Republicans are willing to accept higher taxes to tackle the debt. "The basic problem is that Republicans have gotten us to negotiate against ourselves while they spend money like drunken sailors whenever they're in charge," Schatz said. "If we're going to make progress on college affordability, on health care, and on our core values... we shouldn't be playing their game." Rep. Ro Khanna, D-Calif., who introduced a $1.4 trillion bill to expand the Earned Income Tax Credit, says Democrats should follow the GOP's example and argue their plans will pay for themselves, even if nonpartisan analysts like the Congressional Budget Office disagree. "I think Trump has shown the myopia of austerity politics," Khanna said in an interview. "We need to talk about how our investments will lead to economic growth, but instead we get all tongue-tied talking about who ought to pay for it." But Democratic leaders, some of whom proudly helped pass President Bill Clinton's balanced budgets, are taking a more traditional approach, setting up the potential for conflict if Democrats win back control of the House or Senate. Minority Leader Nancy Pelosi, D-Calif., and Minority Whip Steny Hoyer, D-Md., indicated to The Hill in June that they would reinstate "pay-as-you-go" rules if they retook Congress, a requirement that new spending be offset by cuts or revenue. While Congress has waived these requirements in the past, the news prompted an uproar from progressives. "We need infrastructure, we need debt-free college, we need universal child care — all of these are items that pay dividends to our society and require upfront investment," Rep. Raul Grijalva, D-Ariz., who co-chairs the Congressional Progressive Caucus, told NBC News. "Pay-go stifles any idea about smart investments." On the campaign trail, Democrats also see some political upside in attacking Republicans for deficit spending, especially in red-leaning states and districts. "I think all Americans should care about the deficit and debt and the Democratic Party definitely is the party of fiscal responsibility," Sen. Chris Van Hollen, D-Md., who chairs the Democratic Senatorial Campaign Committee, told NBC News in May. He noted that Senate leaders were emphasizing legislation, like the infrastructure package, that was fully paid for. In Tennessee, Senate candidate Phil Bredesen is touting his balanced budgets as governor and promising to pursue them again in Washington. In Ohio's 12th Congressional District, Democratic Congressional Campaign Committee ads attacked the GOP tax bill using a classic fiscal conservative frame: "When you buy a car or house or go on vacation, you have to think about how you're paying for it — but that's not how it works in Congress," a voice-over said in one TV spot. As the debate heats up, some on the left are asking a more radical question: What if deficits just don't matter? Stephanie Kelton, a professor at Stony Brook University and former economic adviser to Sen. Bernie Sanders, I-Vt., has become a rising star on the left while making the case that the government can print more and more money with little negative consequence, so long as there are idle resources available to justify the spending. "I have a strong sense the American people would care very little about the government's budget outcome if the government was delivering a good economy," Kelton told NBC News. Kelton is the most prominent face of Modern Monetary Theory, a school of economic thought that de-emphasizes deficits and argues the government can take on far more debt than is commonly accepted. 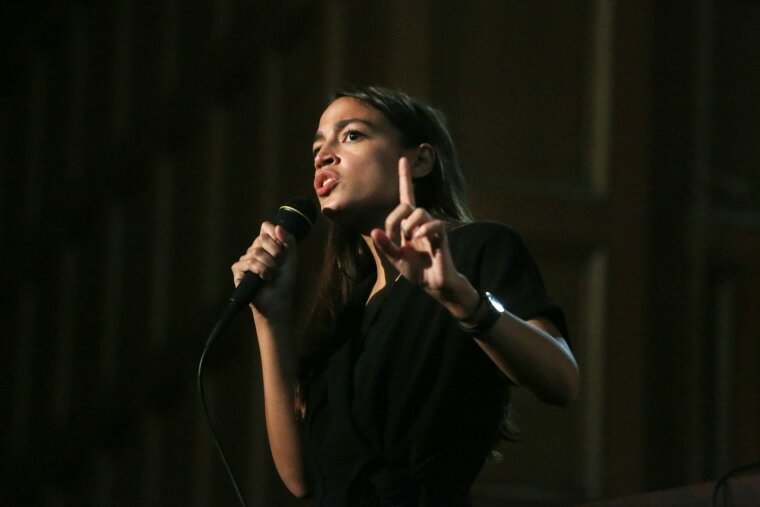 House Democratic candidate Alexandria Ocasio-Cortez has called Kelton a "rock star" and participated in a video conversation with her in May. Like Kelton, she has called on Democrats to aim high on policy, even if it means ignoring deficit scolds. One proposal closely associated with Modern Monetary Theory has gained a solid foothold with Democratic politicians: A federal jobs guarantee. Top-tier 2020 prospects such as Sens. Cory Booker, D-N.J., Kirsten Gillibrand, D-N.Y., and Sanders have backed a bill that would establish a pilot version in select areas. Supporters see it as a way to pump resources into depressed regions and push private employers to raise wages. Scaling it up nationally wouldn't be cheap, which is where Kelton's theory comes in. While there's no CBO score of the Senate bill, her own proposal to provide a $15 an hour job to anyone who wants one estimates its cost at about $400 billion a year. Some of Kelton's ideas dovetail with more common liberal views that the government should run higher deficits during downturns and that President Barack Obama made a mistake not pursuing a larger stimulus in his first term. But Modern Monetary Theory's broader conclusions are still intensely controversial, even among left-leaning economists, with critics warning that too much debt could lead to out-of-control inflation. "The downside risk of getting this wrong on the deficit side is that you've essentially wrecked your economy, maybe for a generation," said Jim Kessler, senior vice president for policy at centrist think tank Third Way and a former adviser to Senator Chuck Schumer, D-N.Y. Many figures on the left are also making a case that blends deficit concerns with progressive goals. They say that Democrats need to prepare voters for higher taxes. This was a key argument underlining Sanders' 2016 run — that Democrats had grown too timid about proposing broad taxes to finance broad benefits and proposed an estimated $15 trillion menu of taxes over a decade that would disproportionately, but not entirely, target wealthy households and corporations. While far short of outside estimates of his health plan, it was nonetheless a big break from recent Democratic presidential candidates. Some activists think the public is ready for this conversation. Sean McElwee, co-founder of Data for Progress, recently released survey data on ideas like expanded public housing, free tuition at public colleges, and paid leave that were paired with proposals to raise income tax on households making over $200,000 and payroll taxes by 0.2 percent. He estimates they'd find majority support in most congressional districts. "I'm not afraid of taxes," McElwee told NBC News. "Our argument is that the American people have been so beaten down by capitalism, so [hurt] by the system, that if you offer them a progressive policy it doesn't matter how much Republicans scream about taxes, you can still win. And the data show that." But Kessler, the Third Way executive, worries that Democrats are mistaking the unpopularity of the latest Republican tax cuts with a newfound openness to pricier government programs, which will face more scrutiny if control of government shifts. As evidence Kessler pointed to struggles in blue states to pass their own version of single-payer health care, including a ballot initiative in Colorado that failed in 2016 with just 21 percent support. Republicans are already beginning to launch attacks on midterm candidates advocating Medicare for All. "For better or for worse, voters see a tax cut as different than government spending," Kessler said. "Public opinion plummets as soon as voters hear about the cost."